When someone has decided to start living a healthy lifestyle, I always suggest making small changes over time in order to develop new healthy habits that will stick. One of the first places I suggest when it comes to cleaning out the pantry and fridge is to get rid of everything that has white sugar and white flour in it. There are so many reasons that white flour and sugar are bad for your health, and I highly suggest you do some research for yourself if you don't already know why that is. Personally, I have found that my weight, my energy, my health, and my overall well being has been dramatically improved since I removed all products with sugar and flour in them years ago. The purpose of this article however is not necessarily to discuss why sugar and white flour are bad for our health, (although I have done so in various places on Dashing Dish), but rather it is to help you learn some easy ways to detox from sugar, and still enjoy sweets! 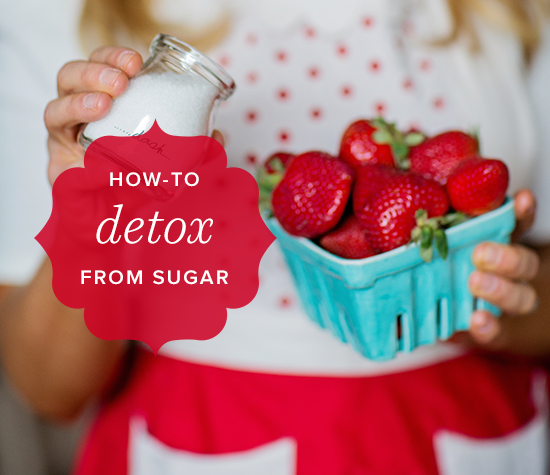 One of the first places that I would suggest detoxing from sugar is to toss your processed and sugar packed foods and start filling your fridge and pantry with natures sweets! I personally love fruit, because it is naturally sweet, and it is packed with nutrition! I know that it can be tough to think about 'getting rid' of some of your (or your families) favorite treats, but once it is out of sight, it will eventually become out of mind! It is so much better to not even have the temptation for sugar in your house! But what about those days that you are craving chocolate, cookies, cake, etc!?! Well, let me be the first to say that I am a 'sweets' girl, so I totally get that! So, instead of cutting out your favorite sweet treats all together, I suggest you replace them with a healthier option...Which is what I provide here at Dashing Dish! What are Some Swap Outs for Sugar? We all know sugar is not the best thing for our bodies, but all those artificial sweeteners aren't good for our health either. So what is a good option that won't spike your blood sugar, or add unnecessary chemicals to your diet? Stevia: This is by far the best natural sweetener I have found. It is derived from a stevia leaf and has been used for years in other countries. It is starting to be used more and more in things like diet soda and drinks. In my opinion, the best brand by far is NuStevia (found at many health food stores, and on Amazon). You can find stevia in the form of powder, a baking blend, packets, or liquid stevia. They even have made flavored liquid stevia, which is great for coffee! The Cons: Well, I haven't found any yet, except some brands do have a bitter taste, which is why I prefer Nu Naturals brand, as it is not bitter at all. Truvia: Truvia is made from the stevia plant and is mixed with another natural sweetener, erythritol. Erythritol is the naturally fermented sugar alcohol found in fruits such as pears and grapes. The Pros: Truvia can be found in most supermarkets. It has the texture of natural sugar, which makes it great to sprinkle on fruit. The Cons: This brand is not as sweet as stevia and it does cause GI discomfort, if used in excess. Xylitol: This is a natural sweetener found in the fibers of many fruits and vegetables. You'll find that most of your sugar-free gum has xylitol in it. The Pros: Research has found that chewing gum with xylitol in it can actually reduce the risk of cavities. The Cons: This sugar alternative unfortunately isn't calorie free. It has 2.4 calories per gram... but hey, its better than sugar! It also does cause a bit of gastrointestinal discomfort if you use it in excess. Maple Syrup, Honey and Agave Nectar: All three are natural sweeteners made in nature. The Pros: Besides the mentioned comparison to honey, some studies state that it is low on the glycemic index, which makes it a better option for diabetics and for weight management. The Cons: The only downfall I have found with these are that they do add calories (about 60 calories in 1 Tbs), and it can't be added as easily to baking recipes, because it is a liquid. Sugar in the Raw and Coconut Sugar: Sugar in the Raw is sugar made exclusively from sugarcane.The juice is extracted from the sugarcane and then crystallized through evaporation to maintain its natural molasses, golden color and distinctive flavor. Coconut sugar is a sugar produced from the sap of cut flower buds of the coconut palm. Coconut sugar has been used as a traditional sweetener for thousands of years in the South and South-East Asian regions where the coconut palm is in abundant supply. The Pros: Depending on the brand you purchase, they could potentially be less processed than white sugar. They also can be swapped out for sugar exactly in baking recipes. The Cons: Both of these sugars have the same number of calories and carbohydrates as regular white sugar. They can also negatively affect your blood glucose levels, especially if you are diabetic. Overall, there is not proof that either of these sugars are any better for you than white sugar. When it comes to sweeteners, I personally like to use baking stevia and stevia packets like I mentioned above. However, all of these recipes call for a sweetener that measures like sugar, which includes any sweetener that can be measured the same as sugar, or you could use sugar if you prefer. If you prefer to use stevia or another sweetener, you will have to alter the amount based on the conversion table below, or according to your desired taste. This can take some experimenting, but once you get a feel for baking with different sweeteners, it is very simple to know how much to use. To get you started, I have provided a simple conversion table that works with stevia. Please also note, that the amounts listed below may vary based on the brand of stevia you are using. 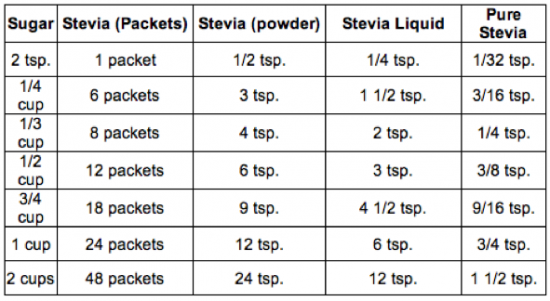 The following chart pertains to NuNaturals stevia, which is the brand I personally recommend. If you are using baking stevia, simply use 1/2 of the sugar the recipe calls for. I also provide a 'sweetener of choice that measures like sugar' in all of my recipes, and if you do choose to use sugar in the raw, coconut sugar, or regular sugar, you can use this for determining the amount to use in the recipe. I hope that this information helps you on your journey to health! To find sugar and flour free recipes that still allow you to enjoy your favorite sweets, be sure to check out the Dessert section on Dashing Dish, and my new Cookbook 100 Simple Recipes for Clean Eating, which is packed with sugar and flour free sweet snacks and treats!